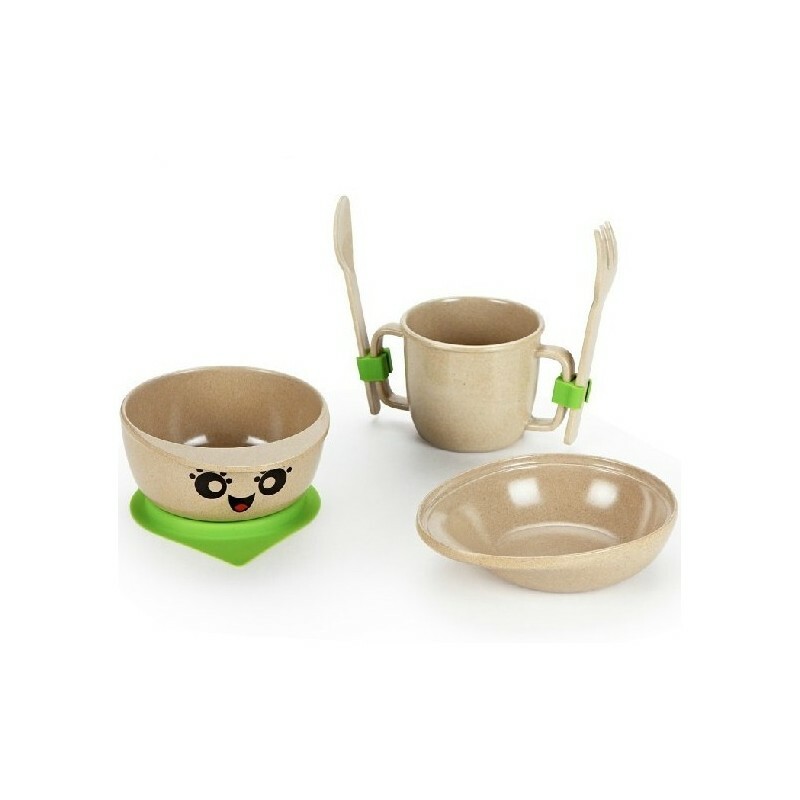 This fantastic Baby or Toddler feeding set by Munch has it all. A cup with handles for easy useage, a baby plate and spoon, fork, bowl and a non slip mat to stop items slipping. 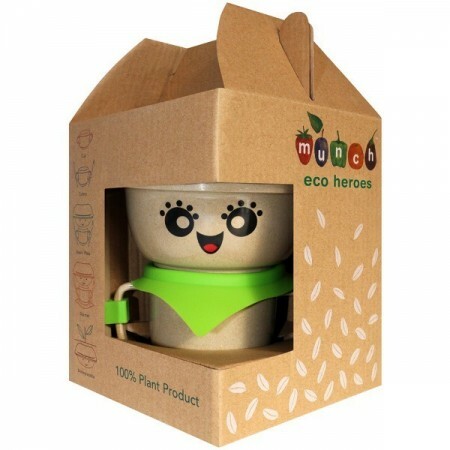 When not in use all parts stack together to form an adorable eco hero. Biodegradable, BPA free and dishwashwer safe. Munch products made from rice husks save energy and reduce greenhouse gas emissions. When you have finished using them, they will biodegrade unlike plastic cups that will be rubbish for ever. 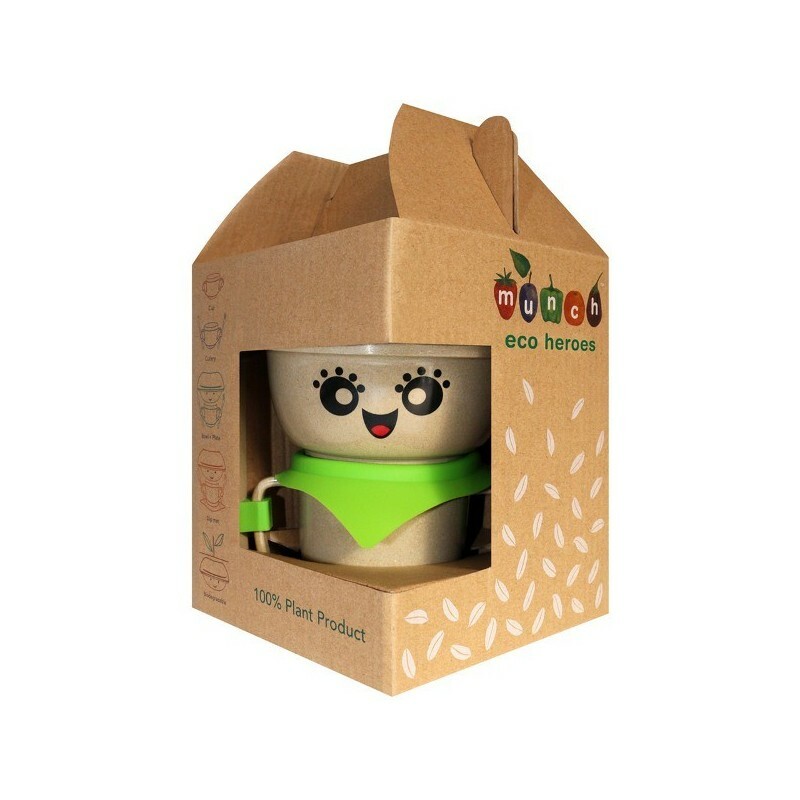 The packaging is also made from recycled and recyclable materials. BPA free, nitrosamines free, phthalates free, lead free, pvc free, melamine free and tritan free. Easy clean, dishwasher safe (top rack). Not microwave safe. Easy grip handles for little hands to hold & reduce spills. Natural wax on the surface may fade on daily usage but does not affect quality. 80% rice husk fibre and 20% starch binder. I got this for my daughter as I need to feed her. The bowl and plate have a special lip that enables me to hold onto firmly so I can feed her. The bottom of both have chipped,unsure how? Spoon is a bit flat. I got this for my little sister while she's learning to eat. It's her 'play' set and it's quite durable since she likes to bang it together.